Since YouTube music channel gathers any of your favorite music videos, top hot tracks from various genres, many users like to download YouTube music videos and directly get audio/music off those MVs for offline playback on iPhone, iPad, iPod, Samsung Galaxy etc. portable players on the go. Although there are piles of online YouTube converters, they usually cannot convert YouTube to WAV etc. lossless files, but only to MP3 etc. lossy ones. 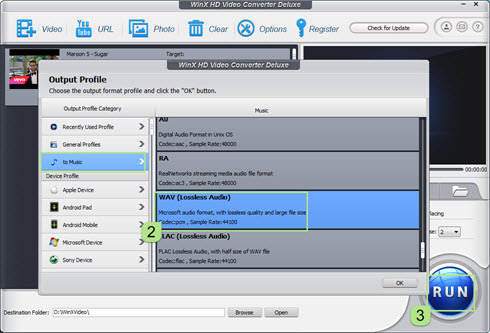 If you are one of them and having trouble in extracting audio from YouTube on Mac or Windows as WAV, this guide is all about guiding you towards converting YouTube to WAV with stable WinX YouTube Downloader Converter may do you a great favor. 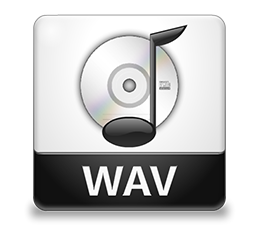 WAV, full name Waveform Audio File Format, is an audio file format and container format used for storing audio bitstream encoded by pulse-code modulation (PCM) and playing raw/uncompressed/lossless digital audio files. It is compatible with Windows, Mac X OS and Linux, playable with amazing effect at player software like Windows Media Player, Real Player, VLC player, iTunes, Quick Time, 5KPlayer and iPhone 6/Plus/5S, iPad mini 3, iPod touch/shuffle/nano, etc. hand-held devices. WAV is jointly brought out by Microsoft and IBM, based on the Resource Interchange File Format (RIFF) to store audio files in indexed "chunks" and "sub-chunks". It's larger than MP3, AAC etc. commonly used compressed formats in size but easy to edit and manipulate with software. Converting YouTube to WAV is an ideal way to copy and hold the original YouTube video's audio data with high quality, which makes you enjoy the hot music offline without buffering at all. How to Download/Convert YouTube to WAV? 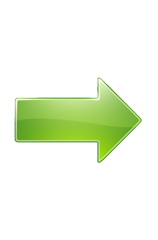 Download convert any video of YouTube to WAV at will. Here a full tutorial on downloading and converting YouTube to WAV file with high quality is shared. Download install it in advance. You will see that WinX software is 100% clean and safe, with no adware, spyware, malware or virus at all. Now go to download convert Bad Blood, Cool for The Summer... so hot music to WAV within seconds! Click "YouTube URL" button to a YouTube downloader window, then copy the URL of the YouTube video you wanna download/convert, "Paste & Analyze" it to upload video information (containing video resolution/format/size/codec), and check a proper one according to your needs. Do not forget to put s tick by "Auto convert". Note: The right URL must begin with "http://www.youtube.com/.....". If you only need to convert stored video to audio file, click "+ Video" to import the source video. Step 1 done, an output profile windows will pop up, where you will find some classified categories: General Profiles, to Music, Device Profile, Web Video Profile and Common Video Profile. Choose "WAV (Lossless Audio)" under "to Music" then hit "OK" to confirm. * Other options under the preview window are selectable to adjust the YouTube to WAV converting quality/speed. When the YouTube to WAV Conversion is undergoing, you can stop it and choose whether to open the output folder or shut down computer when conversion is completed. This tool delivers a 83x faster real time converting speed so that YouTube to WAV can be done within seconds. 1. 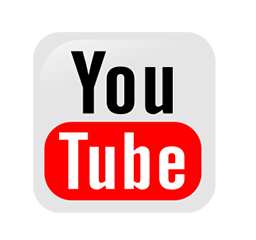 Download convert YouTube SD/HD/4K UHD videos to MP4, iPhone etc. general format/gadgets which are not compatible with YouTube formats for offline playback, hot ones included like iPhone 7, iPad Air 2/mini 4/Pro, H.265. 2. It has both Mac version and Windows version, working well on the hot macOS Sierra and Windows 10. 3. Edit video by croppimg, trimming and add external SRT format subtitle file to video.